Used to be a midfielder with a pessimistic personality. He is pessimistic, which means that he perceives life negatively.An example of his pessimism is when Kudou announces the score order for the practice match against Eito. 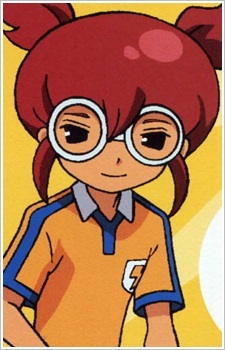 Before Michiya says anything, Hayami says it's a loss for Raimon. He rarely smiled before episode 14. He cares a lot about soccer, but because of Fifth Sector, he was bent on being loyal to them before episode 14. After episode 14, where everyone in the team started rebelling against Fifth Sector, he began have a more optimistic personality and started to support the team more. He seems to be close friends with Hamano Kaiji, usually going fishing with him. After the events in Episode 020 (GO), he isn't that negative and pessimistic anymore and rather starts to enjoy and doesn't say negative things, as shown in Episode 021 (GO) that he laughed when Yamana Akane did not take a photo of Hamano Kaiji during their match against Akizoura Challengers.